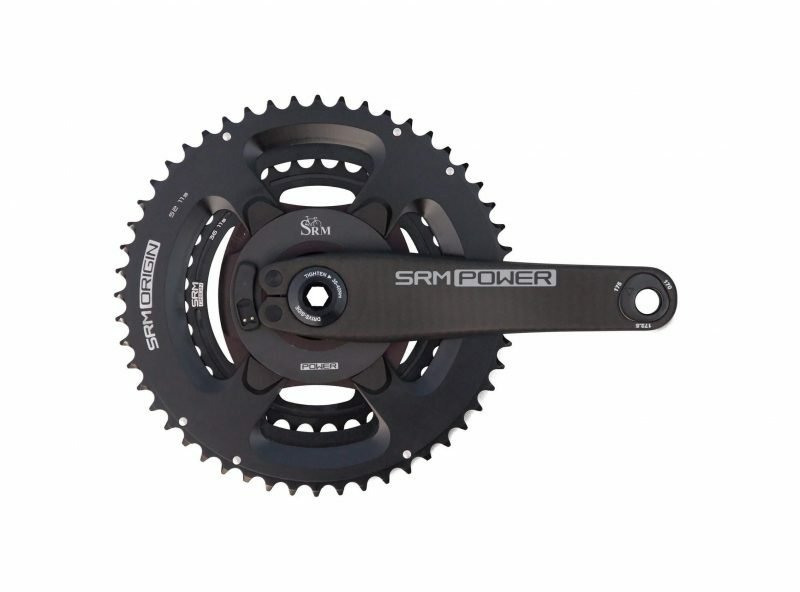 SRM has taken power measurement to the next level with its SRM Origin Road Carbon power meter. Like all SRM power meters, the Origin features SRM’s 144 point calibration protocol, resulting in unmatched accuracy and consistency. However, for the first time, the SRM Origin power meter uses a LOOK carbon crank arm which offers superior stiffness to weight ratio. In fact, the SRM Origin weighs a mere 599 grams! In addition, the LOOK crank arm features Trilobe Technology, which allows the crank arm to function in three lengths, 170 mm, 172.5 mm and 175 mm, simply by rotating the Trilobe pedal inserts. The Origin also offers near limitless compatibility with exchangeable 30 and 24 mm spindles, which means it can be used on virtually any frame on the market. SRM uses a 144 point calibration protocol against a known mass measured to the exact gram. With precise calibration and its Auto-Offset feature, the Origin is accurate to +/- 1.5%. Featuring LOOK carbon crank arms which weigh only 99 grams each, the SRM Origin offers superior stiffness to weight ratio. The entire power meter weighs in at only 599 grams! By simply rotating the Trilobe pedal inserts, the Origin offers three crank arm lengths: 170, 172.5 and 175 mm. In addition, with an exchangeable spindle design, it can be used on a wide variety of frames. You can purchase the Origin with either SRM’s proprietary battery – which features 1,900 hours of battery life – or upgrade to a rechargeable battery for maximum inconvenience. The SRM Origin comes with either a 30 mm or 24 mm spindle which means it is compatible with virtually any frame on the market. If you have any specific questions on compatibility, please contact us and we would be happy to help. The Origin is simply amazing. It’s been set and forget and flat-out perfect performance from day 1. I’ve got 980 miles on it thus far and simply can’t rave about it enough. It’s obviously beautiful, but the performance seems to be out of this world good. Readings are instantaneous, consistent, and oddity/fluke free. The carbon crankarms feel wonderfully stiff…. like when I switched from Giro to Bont shoes…. just a really solid set to push against (of course this might be psychological, but… it’s still awesome). I’m going to be testing out moving from 172.5mm down to 170mm crank length in a week or so, which is just another fantastic option that you get with the Origin. Hi K. Hassell. We are absolutely thrilled to hear the SRM Origin is everything you wanted it to be. We know you waited a while for it and it sounds like it was worth the wait – awesome stuff! Happy training good luck with the 170 mm setting!